Apples of Gold – Fashions inspired by the 1920s have been spotted on runways from Milan to New York this spring, but online jeweler Apples of Gold’s release of its new line of gemstone Art Deco rings isn’t just a jump on the trend bandwagon. Their recently-debuted jewelry collection is designed to evoke feelings of an exciting yet simpler time. Many people are looking back to a bygone era when life was different, when jewelry designs were more artistic and were not monotonously machined as they often are today. Apples of Gold – Fashions inspired by the 1920s have been spotted on runways from Milan to New York this spring, but online jeweler Apples of Gold’s release of its new line of Art Deco Gemstone Rings isn’t just a jump on the trend bandwagon. Their recently-debuted jewelry collection is designed to evoke feelings of an exciting yet simpler time. Depth of artistry is evident in Apples of Gold’s new collection, as is the meticulous craftsmanship with which each ring is created. The geometric shapes and elegant lines that were popular nearly a century ago are reborn to create pieces that are both on trend and timelessly stylish. Yaghtin explains that “Our Art Deco rings stand out from other gemstone rings because of Apples of Gold's exclusive design. It is simply unique and distinguished among other standard settings.” These standout styles include both precious and semi-precious gemstones, ranging from traditional options such as diamonds, rubies and amethyst, to unique stones including white topaz and blue diamonds. 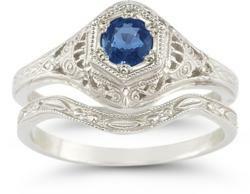 For would-be grooms looking to make an impression when popping the question, Apples of Gold’s gemstone Art Deco collection includes several engagement rings as well as bridal sets. As the pace of life continues to pick up, designs like those in Apples of Gold’s new line of gemstone Art Deco rings are a breath of fresh air. These 1920s-inspired styles are both reminders of the past and examples of timeless artistry. About Apples of Gold: Apples of Gold is an online jeweler with a focus on high quality, personal customer service, affordable pricing and business ethics beyond reproach. They’re a self-described “small-business with a big heart” with a name derived from a biblical proverb. Apples of Gold specializes in fine gold jewelry, wedding rings, diamond jewelry and gemstone pieces, and carries a large selection of Christian jewelry and personalized pieces, in addition to their new line of Art Deco rings. Since the year 2000, they’ve offered top-notch jewelry at value prices. For more information, visit applesofgold.com or follow Apples of Gold Jewelry on Facebook.